One of the most difficult and tiresome of household chores is to keep tile and grout lines clean. Inevitably, all grout lines will darken with dirt and grime simply from daily exposure alone. Mold is all the more likely to develop in the moist areas of the house such as the kitchen and bathroom. Even with the best of intensions and laborious back breaking do-it-yourself efforts, cleaning the grout lines (and keeping them clean) will prove to be difficult. Sealed tile and grout services also get dirty and require a professional cleaning in order to for the original, shiny appearance will be restored. The irony with household cleaners (including those manufactured for tile and grout), regularly leave residues on the surface that actually attract more dirt than before. Echo Carpet Cleaning will resolve your tile and grout issues with our high-powered, professional grade equipment designed to scrub away the grime. Our cleaning equipment uses hot water and environmentally friendly solutions to loosen the dirt and grout not only on the surface but also within the crevices. Once this high powered scrubbing exposes the tile and grout surface, we apply a vacuum equipped with a high-powered rinse procedure to complete the job. The result afterwards is a shinny clean tile and grout surface. For a free evaluation of your tile and grout surface, call us anytime! What are the Reasons you Should Hire Us for Your Tile Maintenance Needs? 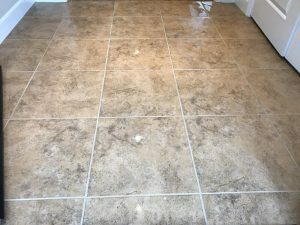 A common issue shared by a majority of people seeking help to clean their tile is locating the right company for the job. An online search gives many results which can make the choice more confusing. For those who regularly clean their tiles, there are often still dust particles and other bacteria which may still manage to penetrate your tiles. Ordinary cleaners may not completely get rid of these microorganisms which may lead to further problems and hazards such as mold. A professional tile cleaner can not only rid your tile of all the hazardous microorganisms, but do so without damaging the tiles. Our trained personnel know how to safely clean your tile in a proper way. You be completely satisfied with the service and can expect top-notch quality results. The most common reason to purchase new tile and grout for the bathrooms and kitchens against damage from water. But just like your carpets, this type of flooring too needs occasional deep cleaning. Echo Carpet Cleaning’s tile and grout service is the best way to regain your floor’s original bright appearance. As the surface of most tiles is rough, it offers a wonderful environment for mold and mildew to flourish. Although cleaning with the correct cleaning products may get rid of the mold, only a professional cleaning method can completely remove their stains. Despite a slick and polished surface being easy to wipe away dirt and scum, many stains will require more work to clear away just as rougher surfaces will like with stone or frosted glass. To maintain the best possible appearance, a professional cleaning may likely be required. The Best Tile Cleaning In Orange County! Most homeowners simply lack the time, energy and motivation to clean their tile and grout themselves on a monthly basis. Just a few months without a proper cleaning will lead to further stains that are not easy to remove, no matter how rigorous the hand scrubbing. Even a mop will work between such deep cleanings but still leaves enough dirt and residue to stain light colored materials. A professional will handle your monthly or incremental cleanings of your tiled floors. The additional result is saving you hours of time, energy and physical soreness. The look of tile floors and walls affects the overall appearance of a bathroom or kitchen. Thus, tiles that are not maintained will reduce the appearance even a beautifully decorated room. Tiles will become dirty rapidly even though they have a diverse appearance which is why a regular cleaning is so important. Echo Carpet Cleaning’s professionals will handle this job so your home looks as beautiful as possible on all fronts. Why Is Cleaning Your Tiles Important? Tiles are often installed in areas that get heavy traffic, like kitchens and bathrooms resulting in various particles of food, dirt and mold quickly staining the tile and grout. Tile manufactured from expensive materials can still be ruined if they are not regularly maintained. Initially temporary stains may become permanent if they are not cleaned at all. Generic cleaning solutions are usually not enough to clean the tiles in your home as they are made in several colors, textures and materials. The wrong cleaner can damage your tiles and lead to a costly error. 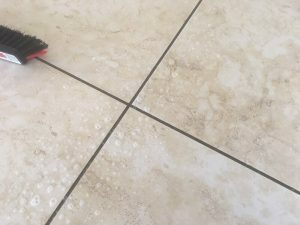 It is essential to identify if you have porcelain, vinyl or stone tiles as the cleaning techniques vary. Despite the durability of most tile floors, cleaning them can take hours and there is no guarantee that stubborn gout stains can be removed. Any tile and grout that is well overdue for a cleaning should be done so by a professional to get the best, shiniest results possible.